CMRLS is seeking a part time shelver to fill a year round position at the Richland Public Library. Duties include shelving library materials and assisting with customer service. Applicants must be able to work some evenings and Saturdays. This position is 14 hours per week. Salary will be minimum wage. Qualifications: Must be 16 years of age or older and must make a passing score on the Library Skills Test. Applications are available at any CMRLS library located in Rankin, Scott, Simpson, and Smith counties. For further information contact Dewayne Hellums, Branch Manager by email or call Richland Public Library at 601-932-1846. Wii and other GAMES @ your library! Brandon Library - Jan. 2, 11:00 a.m. for ages 13-18, registration required. Richland Library - Jan. 8, 6:00 p.m.
Pearl Library - Jan. 12, 6:00 p.m., for grades 5-8. Pizza & FUN! Magee Library - Jan. 20, 4:00 p.m.
Morton Library - Jan. 22, 6:30 p.m., for grades 7-12. Call for details (601-732-6288). Flowood Library - Live CLUE Game - Jan. 14, 4:00 p.m. Need some time out of the house this holiday break. 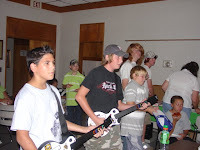 Come see how you rank with the other teens on Guitar Hero-Legends of Rock. 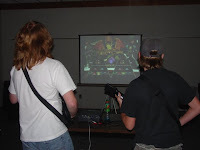 Brandon Public Library is holding a Guitar Hero Tournament Mon. Dec. 29th starting at 11a.m. You will need to come by and registar to play or call us at 601-825-2672. We will then hold a play off day for those who advance on Dec. 30th, and a prize will be awarded to the champion. Morton Public Library will host a Twilight Jeopardy event this Thursday evening at 6:30 p.m. Join us for a fun-filled evening of games and snacks. A drawing will be held for a ticket to the movie. Come and talk with others about one of the hottest YA novels in recent history!!! CMRLS is now on Twitter! You never know where you'll find a library! On the Waiting List for a Stephenie Meyer book?? Me, too! Believe it or not, the staff has to wait just like our patrons to read the hottest books. I have finished Twilight and, as of this morning, I am #4 on the request list for New Moon. If you're like me and anxiously awaiting the next installment of this series but not wanting to dish out $20.00 to buy the book, try one of the other vampiric selections we have on the shelf. So check out one of these books while you're waiting --- they're on the shelf!! "With your hands" says Angela McInnis. We began the evening by playing Etiquette Jeopardy. We divided the teens into groups. I gave a few of the answers away because my fingers clicked a little too fast but I do not think the teens cared. We were surprised by some of the questions for the answers given. Angela McInnis recommends books like Emily Post's Etiquette for any questions regarding manners. It seemed like the teens had an enjoyable time learning how important etiquette is. Refreshments were provided by Kroger, County Market, and Dominos Pizza. The Pearl Public Library kicked off the teen summer reading program with a Meditation and Yoga workshop led by Amanda Rogers. Ms. Rogers is part of the youth services team at the Pearl Public Library. Ms. Rogers offered a very basic introduction into meditation and yoga. She also offered book and DVD suggestions for those who are interested in relaxing one's mind and body. Afterwards teens enjoyed a variety of hot teas provided by Starbucks Coffee, vegetables, fruit, pita bread, and hummus which were provided by Kroger. Next week on June 16 join us at 6:00. We will have guest speaker John Read, publisher and editor of Stay Tooned magazine, a quarterly publication "devoted to the art and business of cartooning." You will find weblinks for homework help and links just for fun here. You may even send any book reviews, comments on library programs, or questions that you wish to share to custsvc@cmrls.lib.ms.us or use this email form. Do you write poetry, short stories, take pictures, draw, or enjoy some other hobby that could be shared here, with other library teens? Send those also, we will look it over and post all appropriate items.